I wanted to make sure to have you covered at different price points and different age groups so there is a mix of something for everyone in this list. Let me know which of these you think your little would love. Edwin The Duck- Move over rubber duckie. Edwin is here to takeover. Seriously, Edwin is amazing. He’s a rubber duckie, bath temperature monitor, sound machine, story teller, speaker and nightlight to name a few. Of course there’s an app (actually more than one) to make your experience even more interactive. And even better the people behind Edwin have offered my readers a 50% discount code. Head over to Edwin’s site and use the code Special50. nabi- I mentioned the nabi Barbie tablet in my Top 5 list from the Toy Insider’s Holiday event. I wanted to make sure everyone knows that they make much more than just a Barbie tablet. And they make tablets for different ages. I’m seriously considering getting my nephew the Elev-8 because it includes The Wings Learning System which in aligned with Common Core Standards. There’s nothing like getting a little to learn when they think they’re getting screen time freedom. Bose Builder- This was another one that made my Top 5 list. I think it’s really cool that our littles can build a working Bose speaker. The app makes it look fun and the littles can personalize it with LED lights and custom covers. DIY meets tech! Circuit Maze- In case you didn’t read my review of this already let me tell you that this game has brought me many moments of quiet. My normally hard to entertain nephew will sit and play this for over an hour. It is great to see him concentrate and figure things out. JustaBXgirl likes to play it as well but for much shorter time frames. Bloxels- I rarely play video games but this is so freaking cool! I haven’t had the chance to play with it but I’ve seen it twice and was impressed both times. This toy allows your little to create an actual video game. JustaBXgirl played with it and just enjoyed putting the blocks in the boxes. I think this is going to be a definite winner this holiday season. Stikbot- This has to be one of the most affordable and awesome things out this season. In a generation that is all about creating videos this is the answer. 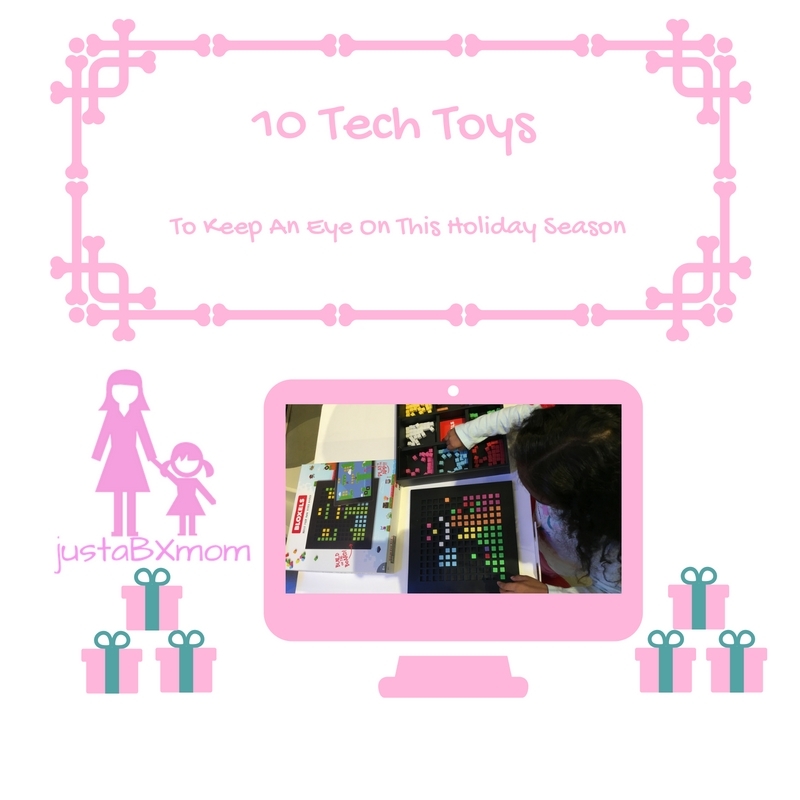 These toys allow your little to take the pictures and make videos using stop motion technology. I have a feeling this will be finding the way under our tree this year. Barbie Hello Dream House- JustaBXgirl has an old doll house that used to belong to my niece. She plays with it for HOURS. However, this Barbie Dream House would definitely be a dream gift. I know you’re wondering what a doll house is doing in a tech guide. Did I mention this was a smart house??? Yup, this house is wifi enabled, has a flushing toilet, stairs that turn into a slide and so much more. And there’s an app that allows your little to further customize the home. It is the most expensive item on this list. Santa, if you’re reading this JustaBXgirl has been a great little girl this year and would love to add this to her toy collection. Think & Learn Code-A-Pillar- This toy goes to show that your little is never too young to start coding! JustaBXgirl played with this a little bit at the TTPM event we went to a few weeks ago. It was nice to see it in action. The child programs it by putting it together and then watches it move. I think this will be fun for them once they realize that they’re controlling it by programming it. Kurio Watch- A smart watch was at the top of JustaBXgirl’s Christmas list last year so of course she got it. It wasn’t this one though so I’m so hoping she doesn’t see this one and ask for it too. This watch is targeted for children 6+ and features really cool features including the ability to connect via bluetooth to Android devices. My favorite feature of this watch will be a parent fave even if the littles don’t care about it. You’re able to program emergency info and contacts into this watch. That’s a little more hitech than me putting my business card in JustaBXgirl’s shoe! Cabbage Patch Kids Baby So Real- I remember when the talking Cabbage Patch came out. I must have been nine or ten and you best believe I still wanted that doll. Of course it was the most popular doll of the season and my parents didn’t shop early (probably where my early Christmas Shopping comes from). I had to wait until after Christmas for my baby but I loved her so very, very much. Her name was Anastasia and I took her everywhere. Baby So Real makes Anastasia look like a relic! JustaBXgirl had the chance to play with her and compared her to Angela The Talking Cat being brought to life. She had to feed her, rock her to sleep and play with her. Doing these things earned her points on an app. It was really cool to think that this could get littles off the screen time by bringing something they play with on the app to life! Love the Cabbage Patch Dolls – is 4 months too early to get one? I had no clue there was a Kurio watch! The Bose Builder looks pretty awesome for a little boy who is turning ten on Friday and I can’t wait to see the Nabi tablet products. Cabbage Patch dolls remind me of my childhood! Thank you JustaBXMom and JustaBXGirl!